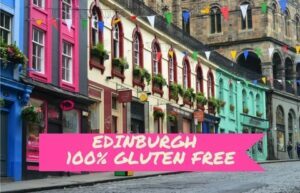 The lovely city of Edinburgh has many great gluten free places to eat, but this post is dedicated to 100% gluten free venues as part of the UK 100% gluten free series. If you know of a business that fits the criteria that is not listed, please let me know via the contact page. Please subscribe (see box to your right), or connect via Facebook or Twitter for updates. See the venue details below or you can download a printable list from the restaurant lists page. You can also hover over the pins on the map. 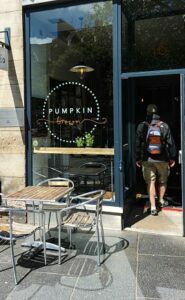 Pumpkin Brown is Edinburgh’s freshest cafe! 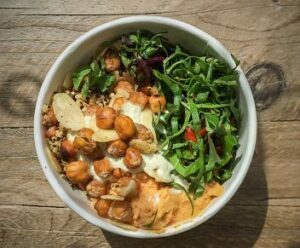 Completely free from gluten and dairy, all Pumpkin Brown’s food is naturally refined sugar free, totally organic, locally sourced and a safe haven for coeliacs with their kitchen having no gluten containing ingredients anywhere. 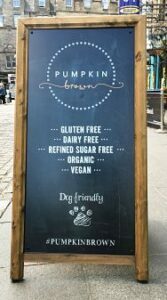 Establishing itself within Edinburgh’s vegan scene, Pumpkin Brown out to nourish the residents of Grassmarket and Old Town with balanced meals, drink full of goodness and speciality coffee. If you have other food intolerances, Pumpkin Brown will be happy to help you. Stop in for breakfast or lunch or get your daily caffeine hit. It is primarily takeaway, but there is a small amount of seating. Indulgent treats everyone can eat! 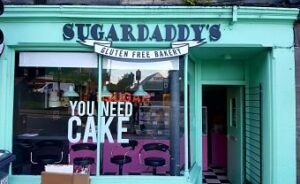 A completely gluten free bakery & cake shop in Edinburgh, that sells treats that everybody can eat! 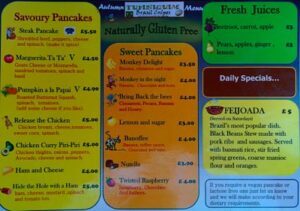 Always coeliac safe and usually dairy free, with egg free and vegan options also available. 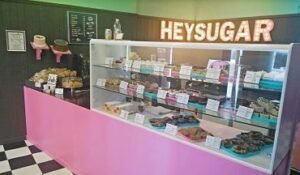 This bakery never uses oats or oat flour, so fantastic for coeliacs also sensitive to oats. 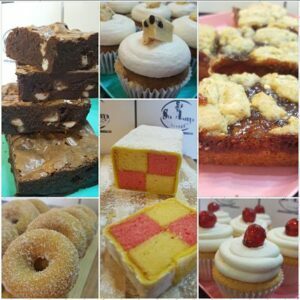 Brownies, blondies, cupcakes & cookies are available daily. All sweets used for decorations are in the Coeliac UK food directory. 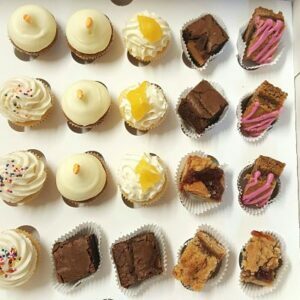 You can custom order celebration cakes and treat boxes (above right) that are made up with a mix of the day’s flavours! Like them on Facebook to see daily specials. If you are looking for gluten free bread, each Friday there is a delivery from FindLaters bakery. The Rodney Street store is primarily takeaway (no savoury options), but there is a small amount of seating. The Roseneath Street bakery is also a cafe, serving light meals (sandwiches, salads, hot meals), and of course cakes and coffee! 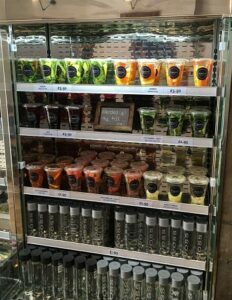 There are many vegan, dairy free or soy free options. For a review by Gluten Free Edinburgh, click here. 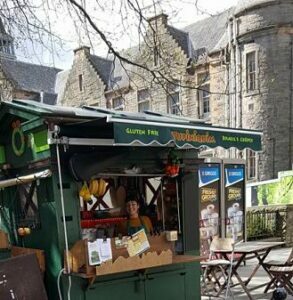 Delicious gluten free crepes and other Brazilian dishes and fresh juices, served from an old police box. For a review of the crepes, please click here. Tupiniquim is also available for catering and festivals. NB: Please note, I have not confirmed gluten free status with owner yet, but this is in progress. I am confident it is gluten free based on menus and reviews. “Good Food. 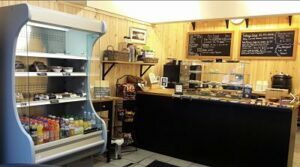 Gluten Free.” Take away café selling wraps and sandwiches, soup, pasta, fries, cakes and treats. Wheat Free Bakery Direct products are sold here. There are two seats by the window if you do need to eat in! This venue closed in Feb 2018. Things have certainly come on a lot, particularly in the last 10 years!